Celebrate the great lake in your life with this custom cribbage board laser-etched with an aerial view. This custom-made cribbage board is sure to score big time on your next boating trip or weekend at the lake. As points are gained, you'll move your markers around a laser-etched map of your favorite lake. There are more than 4,000 lakes to choose from, and they are marked with both topographical rings to show the shifting depths of the water, and details from the surrounding area, such as major roads and cities. The handsome, cherry wood board also has a corked compartment along its front edge for storing the included bronze and aluminum pegs. Made in Michigan. Click here to see a complete list of available lakes and coastal regions. Don't know how to play cribbage? Neither did we! So we studied up, played some games, had tons of fun, and wrote about it. Click here to learn how to play. 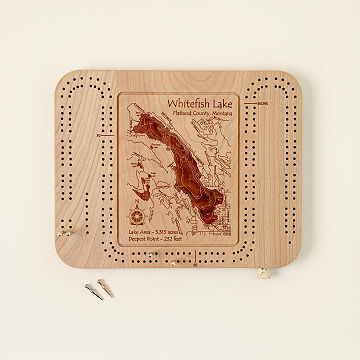 Custom Lake Art Cribbage Board is a 2 player board. Playing cards not included. It's a perfect reminder of time spent with friends & family on this lake. My boyfriend and his family love to play Cribbage. They have also been going to a particular lake every summer for a long tim. I thought this was the perfect gift...and I was right! He loved it! And his family loved it too! Beautifully made. LOVE the detail. Cribbage is a fun game to play together. The board is not tucked away with our other games. We have it displayed. A piece of art! It is a game....so people will play it! Such a beautiful way to combine different loves into one gift.